I’m not planning on making this a regular or weekly feature – it’s just that it’s going to be Friday when this goes up, and I still like alliteration. Anyway, I’m taking a brain break from some pretty intense data-gathering by indulging in this little bit of creativity. I hope you enjoy it! I’ve linked this before, but here’s where you can find it: I just used the basic “Forge” option. Void Iron – A great iron maul; a holy artifact of the cult of Umu. The head of this hammer has zero mass. It imparts no momentum or impact to what it strikes. For most people, this makes it at best a great tool for pranks and tricks. In the hands of a truly faithful follower of Umu, though, it becomes a deadly weapon that creates bubbles of pure vacuum wherever it strikes. Warning: using it within an atmosphere subjects the wielder to frequent shock-wave stress from air rushing in to fill the voids, and Nature targets you with increasing abhorrence the more you use it. Wander Tide – A fay tide. One may walk out into the ebbing surf until completely submerged within the water, then turn and walk back to land, and find oneself on a completely foreign shore. This is always a one-way trip to a random destination. Some coastal tribes have learned to recognize this rare phenomenon and send selected members of their communities through it on sacred quests. Slow Judge – A massive, mossy sloth (or one of a tribe of them?) living on a certain small island in the Diarchal Archipelago. In case of an intractable conflict, petitioners may travel to the island and perform a ceremony involving offerings of tender shoots and leaves, with each side presenting their case. Eventually a sloth moves ponderously out of the jungle, approaches one of the supplicants at random, and reaches out with one enormous claw, leaving behind a mark that clearly indicates the Judge’s ruling. Since it can take days before a Judge appears, cases are often presented in a highly stylized, time-killing format such as dance or drama or epic poetry, and on occasion these ceremonies have resolved the issue – through compromise or violence – before a Judge can become involved. Battle Poet – The Battle Poet is an immortal entity that travels the lands looking for military conflict. It is a humanoid figure in full, heavy armor, no features visible. It carries no weapons, apparently happy to take one from someone when it feels ready to fight, but also willing and able to use its gauntlet-clad fists. When it finds a battle, it observes for a while before choosing a side to fight for. It fights with apparent pleasure, but not in such a pivotal role that sages or scholars can say with any certainty that it actually affects the course of history. (Then again, sages and scholars are as yet unaware of many of the more subtle mechanisms by which history operates.) It is termed “poet” because it will occasionally leave behind a lyrical inscription – etched in stone, scratched into a sword blade, daubed in blood on a shield. 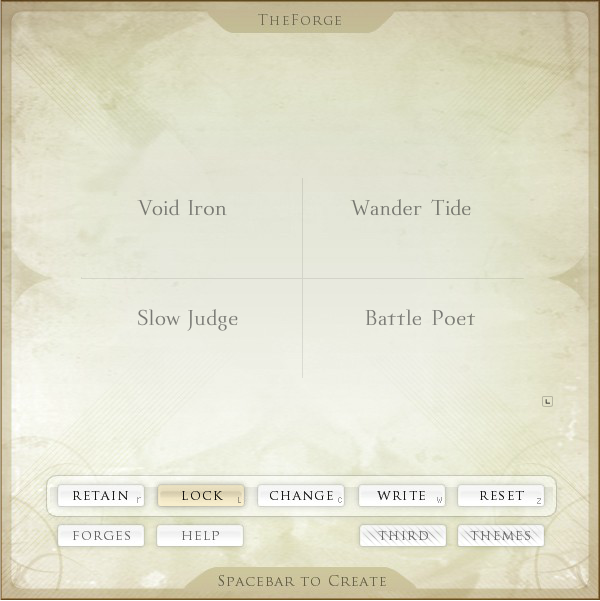 This entry was posted in Setting, World-Building and tagged Battle Poet, Forge, Slow Judge, Void Iron, Wander Tide. Bookmark the permalink.